Facebook Exchange (FBX) was announced over a year ago, at that time it seemed like the only people who could access it were the bigger advertisers with 5-6 figure monthly budgets. Perfect Audience is a Y Combinator backed company that's working on making FBX accessible to everyone. Recently while preparing for the recent webinar with SiteScout, I decided it was time to finally give FBX and Perfect Audience a try. The account sign up and setup was relatively easy, I had some minor confusion about setup but live support was readily available and I ended up talking with Brad, who's is one of the co-founders of the company. It's always cool to find founders doing tech support. After uploading my ads and waiting for approval, my ads were live. One of the things I'm sill getting used to is the fact that stats are updated once an hour instead of real time. I'm so used to being about to use Spy View in Tracking202 & Prosper202 to see what's going on in real-time. My campaign for the webinar ran from February 7th through the 22nd. You can see details of how it did in the screenshot below. So first of all, the number of impressions were not that high, and over the span of the campaigns I only got 87 clicks. But this was due to the fact that my retargeting pool size was quite small. I only had a few thousand people available to target. The exciting part about this whole test was the conversion rate and cost per acquisition. Based on the screenshot you'd think that my conversion rate was 44.8% would would be awesome. 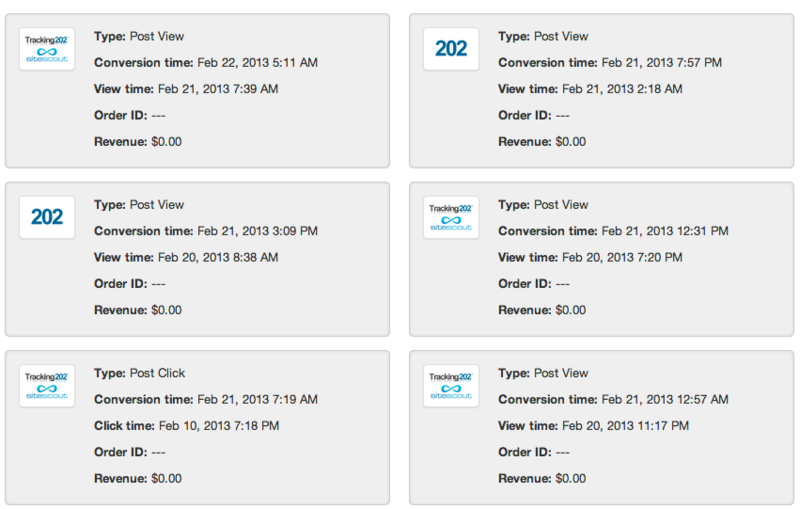 However the stats show a combination of Post Click and Post View conversions. I had 12 click-through conversions, for a conversion rate of 13.79%. I had 27 view-through conversions with a conversion rate of 0.091%. Before I continue, I wanted to talk a bit about view-through conversions. There are many times where a person may see an ad online but never click on the ad. However, later on they may interact with your brand via another channel or directly type in your url and finally convert. Without VTC stats, you wouldn't know that your campaign had a role in assisting in conversions. In my situation, some of these people may have seen my ad on Facebook, then later on read a blog post, visited the tracking202 fan page, or maybe clicked on an email promotion and finally registered for the webinar. I don't know for sure, but during the webinar people mentioned that they noticed the ads and signed up for the webinar because of the ads. VTC rates's are calculated with the entire number impressions served, which is why the conversion rate of 0.091% looks so low. To me the important part was that I was able to use my Perfect Audience FBX campaign to add another 39 registrants to my webinar at a cost of only $0.80 each. 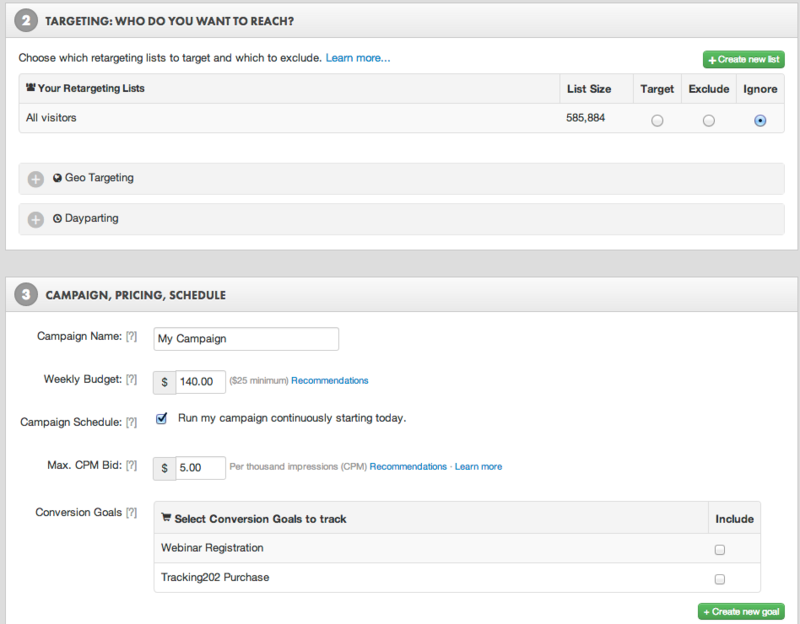 In the image below, you can see an example report showing Post View and Post Click conversions for my campaign. You can see that many of the Post View conversion are happening many hours after my ad was initially seen. Perfect Audience is awesome, but it's not yet perfect. There are still a few rough edges that need to be worked on. For example the billing system is a bit weird and confusing. I've had conversions with Brad about this and they've already made fixes to some of the annoying aspects of it. For example, in Facebook, I'm used to setting a high budget for a campaign. Currently, in Perfect Audience it's best to start low with your campaign budget, then raise it based on how well your campaign is working. The reason for this is that, you will get billed right away for whatever you set your budget to, additionally budgets are currently tied to campaigns so each campaigns' budget and billing is separate. When you pause a campaign, you have the option of transferring unspent funds to another campaign. This transfer is not instant, so you'll have to allow for some time for the transfer to complete. Over all, I'm really happy with FBX and especially Perfect Audience. I believe that it can work wonders for anyone doing direct response marketing, If you are driving a lot of traffic, you can doo quite well with Facebook retargeting. You'll most likely get more impressions and clicks than I got with my campaigns. When you try out Perfect Audience you'll get $60 of free ad spend to spend during the 2 week trial period. I didn't even spend all of my $60, but it was enough to drive some meaningful conversions and results. I'm still running retargeting campaigns on Perfect Audience. I'd share what I'm running with you, but that may skew my data. So fo now it's a secret, I'll probably blog about this test later on when all the data comes in.